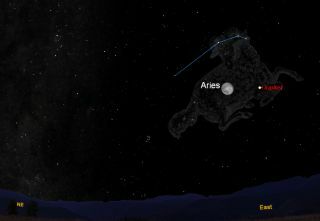 This sky map of the moon and Jupiter shows how the two bright objects will appear together to skywatchers with clear skies at 10 p.m. local time Oct. 13, 2011 from mid-northern latitudes. The two most brilliant objects in our current night sky will make for an eye-catching duo tonight (Oct. 13), weather permitting. Looking low to the east-northeast around 7:30 p.m. local daylight time, you’ll see a nearly full waning gibbous moon. Sitting just to the right of the moon will be the lordly light belonging to the largest planet in our solar system: Jupiter. Jupiter will hover about 5 degrees from the moon's right. Your clenched fist held at arm's length covers about 10 degrees, so moon and Jupiter will be separated by about half a fist. The sky map of the moon and Jupiter here shows how they will appear together tonight. By around 1 a.m. local daylight time (early Friday morning), the moon will seem to hover high above and to Jupiter's left. By 6:30 a.m. — with morning twilight rapidly brightening the sky in the east — the moon will seem to hang high and almost directly above Jupiter. In the days that follow, the moon will pull away to the east and diminish in illumination, leaving glorious Jupiter to rule the October night. On Oct. 28, Jupiter will arrive at opposition against the sparse background stars of the constellation Aries, the Ram. Since it is then opposite to the sun, the planet rises at sunset, crosses the sky from east to west during the night and sets at sunrise. Beginning in November, Jupiter will already be up in the eastern sky when the sun goes down. This will continue for the rest of the fall season in the Northern Hemisphere. Opposition generally brings a "superior" planet (an outer planet as compared with Earth) closest to the Earth, and this is why Jupiter now shines more brilliantly than it has all year. Astronomers use a reverse number scale to measure the brightness of objects in the sky, with smaller numbers corresponding to brighter objects. A negative number, for example, represents an extremely bright object. At an eye-popping magnitude of - 2.9 — fully four times brighter than Sirius, the brightest star — Jupiter is far brighterthan any nighttime star. But this year's apparition of Jupiter is an exceptionally good one. Although "Big Jupe" comes to opposition every 13 months (every time the Earth sweeps between it and the sun), 2011 is also Jupiter's year of perihelion. This is when it is closest to the sun in its 12-year orbit, so it's also particularly close to the Earth. Jupiter is 33 light-minutes away this month, compared to its most distant opposition of the last decade in 2005. Actually, last October's opposition placed Jupiter about 1.5 million miles (2.4 million kilometers) closer than this year, but that makes no difference in how bright Jupiter is now compared to a year ago, and in a telescope, its apparent disk size measures only 0.4 percent smaller. Truth be told, for the next month or so, Jupiter's disk is the most generous that a planet can be: large and fully illuminated, and — when observed with a good telescope — decorated with numerous bands and other intricate features. In fact, there are now more features and surface area visible on this one disk than on all the other planets combined. And after this year, Jupiter will not attain such a pinnacle of extreme brilliance again until the year 2022. On Thursday evening, good binoculars or a telescopewill reveal three of the famous Galilean satellites during the early evening hours: Ganymede and Europa on one side of Jupiter, with Callisto on the other. Io and its shadow will be passing in front of Jupiter, an event that can be seen in moderate-sized telescopes. Io's shadow will be evident as a tiny black dot and is called a shadow transit. Io itself may be invisible from insufficient contrast with the background disk of Jupiter, but it can be readily seen for a short while as a white dot just as it is about to move off of Jupiter's west limb (at 10:03 p.m. EDT, 0230 GMT). Io's shadow will move off Jupiter's disk 23 minutes earlier at 9:40 p.m. EDT (0140 GMT). If you snap an amazing photo of Jupiter, the moon or the moon and Jupiter together, and would like to share the image with SPACE.com for a possible gallery or story please contact managing editor Tariq Malik at tmalik@space.com.